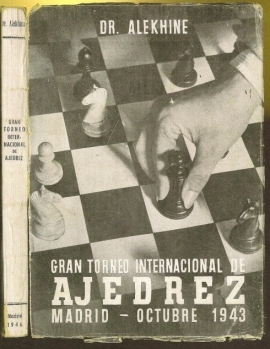 218 pages with tables and biography of the players. Duodecimo (6 3/4" x 4 3/4") issued in wrappers. Prologue by Jose M de Cossio. (Bibliotheca Van der Linde-Niemeijeriana:5638) First edition. 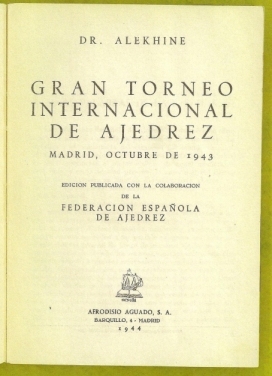 Madrid had high expectations of seven international masters. However, only three attended and was won by Keres 14 1/2 ahead of Fuentes 11 1/2 and Alfred Brinckmann 9 1/2. 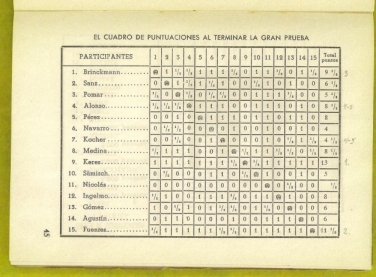 Young Arturo Poma, age 12, after a poor start ended scoring 5 1/2. Edges, spine and hinge chipped, some occasional pencil notations else a good to very good copy.